Because I didn’t have any “summer beers” on tap, I opted to speed-carbonate my West Coast Wheat Beer. This entailed two days at 40 psi and 42°, which did indeed carbonate things quite nicely. If anything, it might have overcarbonated a touch (based on the foaminess when I tapped the keg and poured the initial glasses). My hope is that this will get reduced as the beer sits at the standard serving / carbonating pressure for my system. In any case, the beer has a positively thick and massive head, almost meringue-like. I guess this is what happens when you do an all-grain wheat beer! I’m quite pleased. 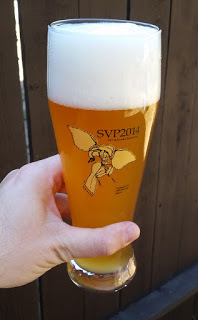 The beer itself is quite delicious too, and I’ll do a full tasting once it has had a chance to mature a bit more.